Long time George Strait drummer and member of the Ace in the Hole Band Mike Kennedy died in an automobile accident on Interstate 40 Friday afternoon (8-31) in Lebanon, Tennessee just west of Nashville. He was 59-years-old. Many in the country music community are morning the loss of one of the most beloved backline players in the business. Fans from across the country and world have been leaving their condolences, sharing their stories, and remembering the legacy of an indispensable member of one of the most legendary backing bands in country music history. On Sunday morning (9-2), “King” George Strait himself addressed the loss of the man who played drums behind him for 28 years. Like George Strait, Mike Kennedy grew up near San Antonio. He started playing drums and bass in his father’s country band, and after playing with numerous local artists, Kennedy started playing drums for national country star Barbara Fairchild. He then played with Ricky Skaggs for five years before being hired by George Strait, who Kennedy played with all the way up until his death. Mike Kennedy was one of the newer members of the Ace in the Hole Band, which originally formed in the mid 70’s in San Marcos, TX where George Strait attended college. 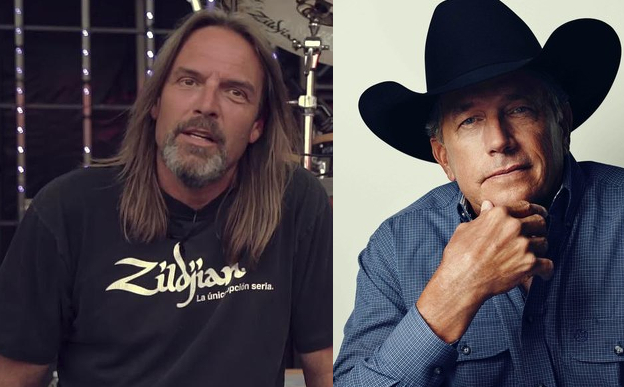 When original drummer Tommy Foote left the Ace in the Hole Band in 1983 to become George Strait’s official road manager, Mike Kennedy replaced him right as George Strait’s Hall of Fame career was taking off. Kennedy’s 1999 GMC Sierra hit a tractor trailer near the 238 mile marker on I-40 in Lebanon, TN, and eventually collided with a Chevrolet Silverado according to the Tennessee Highway Patrol. Kennedy was the only fatality in the accident. Neither of the other two individuals involved in the accident were seriously injured. Kennedy lived in Baxter, which is a rural town in Putnam County east of Nashville. Information on funeral arrangements is pending. This is truly a heartbreaking situation.I’m praying for George,the band,as well as Mike’s family. I have fan of George Straits for many years, seen him in concerts many times. It sadden my heart to hear the passing of Mike., he was an Awesome drummer! The Ace in the hole is a great band , the best to me! My thoughts and prayers are with his family and George and the band . God bless everyone who knew and loved him. Res in peace Mike. A GREAT LOSS. PRAYERS FOR FAMILY AND FRIENDS…(SEGUIIN, TX)……..
Well sheeit- idnt George supposed to be comin out with an album soon tho ? So sorry for this enormous loss. My prayers go out to all who knew and loved him. May God watch over you and get you through this time of grief. One of the many years that George and the Band played in Lafayette Louisiana, it was rainy and cold! Mike, Ronnie and Tom and a few other band members stayed and had a few drinks with me (Beverly) and My friend Debbie. We had all become good friends during our chasing George Straight days. Mike had falling asleep and got left behind! I got woke up to a banging on the door, when I opened the door there stood Mike like a child saying they (the bus) had left him And he needed my help! The band was playing in Jackson Mississippi the following night, I calmed Mike down and told him I would help! We tried the local airport and they had nothing! So on this rainy and sleeting day I got to know Mike Kennedy! It was like a 4 hour drive on a sunny day so it was going to take us longer due to the weather. Mike was a very kind and gracious person full of fun and laughter He was such a Happy Pearson and very down to earth. He must had said thank you A million times! All he would say was he was going to get in trouble if he wasn’t there for sound check at 3 pm, I recall him looking at his watch the whole time I was driving, I finally told him to give me his watch because I was going to get him there as fast as I could and for him not to worry, We finally made it to Jackson By God’s Grace on ttime. We got to talk to George and he thanked us for bringing him (mike) all that way. That’s what friends are for I said. George gave us Great seats for the concert! And lots of hugs! To this day I bet Mike never put his stuff in his bunk and closed the curtains! Lol because that’s how he go left. The bus driver thought he was in his bunk sleeping. And you see my friends that’s how I meet the Great and wonderful “Mike” May You Rest In Peace My Friend! Also with George Strait and the Ace in the Hole Band.Very saddening to hear of such a loss. God Bless Mike and all of his family and friends. This is a sad time and I know George’s band will miss him so much. Love all of you. May you rest in peace Mike. Love you. New Mike when he first started out and he played in my brother’s (John Donaho) band. Such a nice guy and so sorry for his immediate family, music family and friends. We’ve lost another great one. Now, he, John and Randy Reinhard can jam again like old times. My, Deepest Condolences, and prayers go out to the family, and friends of Mike’s. As well as George Strait, and the Ace And the Hole band members. This is a very sad day for y’all. Not only did you loss a great friend, but also a great drummer. May God be with y’all.